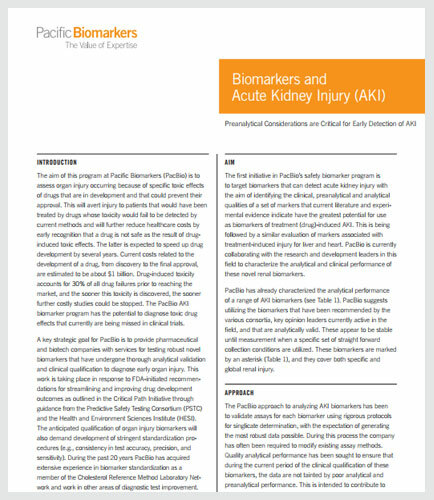 "Biomarkers for the prediction of acute kidney injury: A review on current status and future challenges"
Biomarker of acute kidney injury (AKI) is strongly associated with increased morbidity and mortality in critically ill patients. The approach to analyzing AKI biomarkers has been to provide pharmaceutical and biotech companies with services for testing robust novel biomarkers that have undergone thorough analytical validation and clinical qualification with the expectation to diagnose early organ injury. How to target biomarkers that can detect acute kidney injury (AKI) and what the potential of an AKI biomarker program is. What are the issues surrounding the best methods of collecting and storing urine used for detection of AKI in human subjects? Disruption used to mean a true shift in the market that blew minds and emptied walls. Disruption may be a waning model for innovation, but there’s a pot of proverbial gold on your product roadmap- and they’ve been there the whole time. This whitepaper explores why a user-focused, design-led mentality for technology products delights markets and satisfies that picky user in all of us. Key takeaways from this whitepaper: What’s being called “disruption” is really a dressed-up version of imitation How the user perspective turned airbnb around “What is” should lead to “what if” It’s time to get started. Bring your designers into the process early. Run tests!